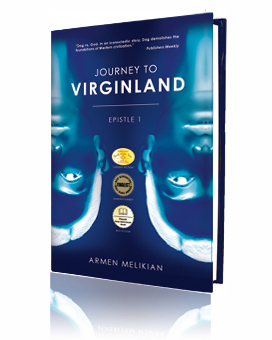 Journey to Virginland, the debut novel by the American author Armen Melikian (known in Armenia as Dog Son of Dog), engages in a direct conversation with the Turkish author Orhan Pamuk’s Snow. In a sense, Journey to Virginland continues Orhan Pamuk’s narrative on the other side of the border from Kars, through a fresh and dazzling discussion of philosophical, religious, political, sexual, and gender issues taken on by Orhan Pamuk’s Snow. Melikian widens the scope of the investigation that Pamuk’s protagonist, Ka, ostensibly undertakes in exposing the cultural milieu that envelops the suicide epidemic of adolescent women in Pamuk’s traditional society. Melikian’s work has been compared to “George Orwell’s classics and other authors of similar stature” by New York Times bestselling author Prof. Paul McCarthy of Ulster University, Ireland, whose lifelong career has included key posts at three of the largest publishing houses in the world. Orhan Pamuk’s story takes place mostly in Kars, a formerly Armenian province; Melikian’s novel unfolds in neighboring Armenia. Both societies have once shared the Ottoman rule. From either side of the border and in the same general time period, both Melikian and Pamuk mount an intricate, panoramic critique of their respective homelands, treating their subjects – and subject matter – with naked honesty and ultimately a profound humanness that lets us in on the possible shape of things to come. Orhan Pamuk (born 1952) is one of Turkey’s most celebrated and controversial writers. Armen Melikian (born 1963) is a powerful new voice in Armenian literature. Both Melikian and Pamuk have been at turns acclaimed and ostracized in their homelands, for shattering taboos and proposing a quest for identity beyond dogma and fanaticism. The Turkish author Orhan Pamuk’s works, Snow in particular, share many thematic similarities with the American author Armen Melikian’s Journey to Virginland, who has lived in Armenia for a period of three years and in no uncertain terms has been exiled back to the United States due to his literary endeavors. While Melikian has a style and identity a, who has lived in Armenia for a period of three years and in no uncertain terms has been exiled back to the United States due to his literary endeavors. While Melikian has a style and identity all his own, he, like Orhan Pamuk, is an erudite critic of East and West, of literal traditionalism and modernism alike, focusing on the multilayered foibles and contradictions of 21st-century Armenian society. For more information about Orhan Pamuk’s unexpectedly appearing and archetypal Armenian "double," whom Pamuk has once searched for in Istanbul, or to get your copy ofJourney to Virginland visit www.JourneytoVirginland.com.